Welcome to the newly opened Inn ( Lodging for the night) Tufna Home. Located right on the most vibrant pedestrian street in the centre of Sarajevo, street Ferhadija. Nearest tram stop is just 40 m away. There are countless traditional restaurants and bars in the surrounding area. 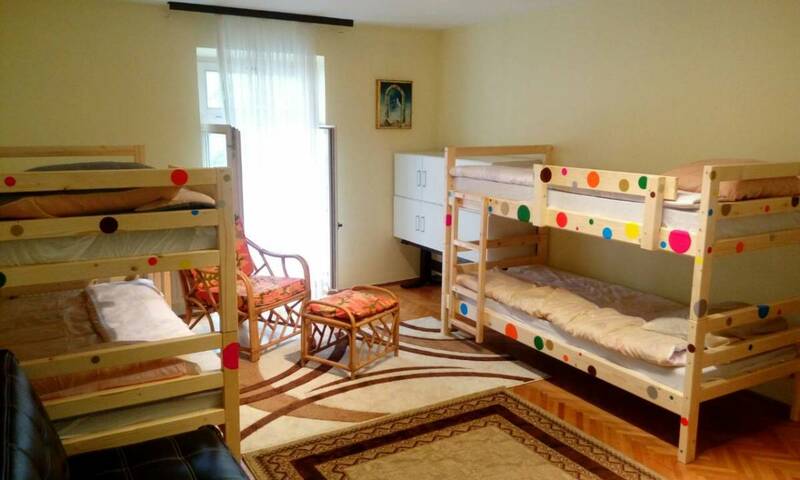 Located right on the most vibrant pedestrian street in the centre of Sarajevo, street Ferhadija. There are countless traditional restaurants and bars in the surrounding area. The main amenities is location . It is located in pedisterian area with amazing view on center and many interesting things. Our hostel is located right in the middle of the old town. You’re just a quick walk away from all the most important sights; including the assassination spot of Franz Ferdinand, the Sacred Heart Cathedral, the Srebrenica exhibition, the Serbian Orthodox Cathedral as well as the Jewish Synagogue. The best food is also right in front of our doorstep. All the best local specialities are right here in the old town. For those of you who want to have a great night out in the city: all the best clubs and pubs are just a 5 minute walk away from our hostel and our experienced staff will point you in the direction of all the best gigs and parties. If you are arriving at the Sarajevo airport, the easiest way to get to the hostel would be to use the taxi services, which in our city are not too expensive. You can also simply contact us and we will provide you the transportation. Transport options> Traim to train station Latinska Cuprija (Latin bridge). Ticket cost 1. 80BAM. Trolleybus number 103 you will have to get off the trolley at the stop called 'Trg Austrije' After a five-minutes walk you will arrive at the hostel.